RPGs are often rated on their ability to enthrall audiences with epic stories set in vivid worlds where titanic struggles between incredible armies of good and evil seem almost like an everyday occurrence. 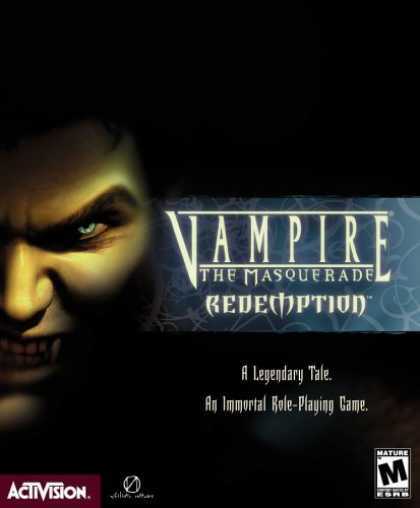 However, every now and then, there comes an RPG which seems to captivate an audience with an additional "odd quirk"... and Vampire: The Masquerade - Redemption is one of those games. When I picked up the game for the first time, I didn't even look at the box before popping it into my computer - so my surprise was complete and delightful when I discovered that my crusading master-of-disaster Christof was going to be given guns. For some strange reason which I still cannot understand, I thought that was the coolest idea I had ever seen. There is just something very appealing to me about a "knight in shining armor" with a chain gun and a full vernacular of archaic English eviscerating his enemies. Aside from this attraction, I found Redemption to have a compelling story and an enjoyable flow of events. The quests lack a unique flavor since the game is first and foremost a hack n' slash, but Redemption is still definitely a game to check out. Let me tell you why. The story starts out with your character (Christof) being wounded in a battle with barbarians during one of the crusades. After that cutscene, and a little tidbit between Christof and a nun named Anezka, the action begins. Between deformed munchkin Szlachta, ghouls (in the form of humans, rats, and spiders), vampires from several clans, and a few other enemies, my left mouse button knew little rest for days. Throughout the course of the game, I was sent through dungeon after dungeon where I laid down all opposition with brutal efficiency. However, the highlight of my adventure occurred when I came across what would become my weapon of choice, good friend, and solution to absolutely every obstacle I came across: the Ainkurn Sword. Between its bloodsucking edge and the massive amounts of firepower my party members laid upon anything that moved, my enemies could do nothing against me. This sense of absolute overkill was the source of a great deal of personal pride and enjoyment for me which carried hrough for the entirety of the game. Aside from the obvious power my character wielded, the dialogue was particularly entertaining. During the medieval portion of the game all of the "thy" and "thou" gibberish can amount to a slightly irritating experience for the easily excitable. However, once Christof wakes up in London and more particularly comes into contact with a character named Pink, the dialogue takes a more humorous twist. All throughout the modern portion of the game, Christof's ignorance of the modern world and Pink's colorful personality combine to create a laughable banter between the characters (I actually fell out of my chair during a particularly humorous interchange involving the central computer of the FBI). Although I was dismayed when I was forced to kill one of my party members (as his visage alone is enough to make someone giggle let alone his voice and actual lines), I found the game as a whole to have a touch of humor while not deliberately trying to be funny. When it comes time to talk of the graphical aspects of a game, I always cringe a small bit. To tell the truth, the graphics of a game don't really interest me all that much (probably because I have such an awful computer that I can't afford to see games utilizing their full graphical potential). However, since Redemption is an older game, I could easily set the graphics to their highest settings. While the game is no match for the more recently released Bloodlines, it had a unique appeal of its own. It actually reminded me of a suped-up version of the Might & Magic engine with the added benefit of actually seeing your character instead of just a portrait. The cutscenes are very well done, with particular moments (like the intricate look at the Haus de Hexe in Vienna) accentuated just enough to keep your interest, as well as keep the game's momentum going. While the graphics of Redemption are not deserving of any encores, they are visually enticing to say the least. As for general replay value, Redemption has a decent amount in the single player version (although the primary quest is very linear) and even more if you're willing to partake in its multiplayer functionality. Since Bloodlines did not release with any sort of multiplayer capabilities at all, your only solution to online V:tM role-playing is Redemption. In addition to the single player storyline and its multiplayer functionality, Redemption also has a vast number of mods available around the community if you know where to look. Several of these are very good and will add plenty of enjoyment even after you've finished the game. Even with these positive features, though, I do have a couple of complaints. The main area of this game which I was disappointed with was the mechanics of party control. Several times during the game, I was forced to reload a previous save because one of my companions would catch a glimpse of an opponent and charge after it arousing the blood thirst of my entire party. Of course, the single opponent would turn out to be one of five or eight and my entire group would be in torpor before I would even begin to know what was going on. The one addition which I think could have exponentially improved the ease of play for Redemption would have been the addition of a pause key. I read after I had beaten Redemption that the game could be paused using the console but I never really looked into it. I just think a pause key could go a long way in eliminating the hassle I encountered while trying to manage my party. Altogether, if you are looking for a game to keep you entertained for a considerable period of time, I would definitely recommend buying Redemption. The game's pros vastly outweigh the cons and it's available for a very reasonable price due to its age. Who can deny the entertainment value of playing an immortal vampire?